1. Introduction. Please read this page carefully. It contains the terms and conditions (the “Terms and Conditions”) governing your access to and use of the Penn Apartment Staffing Web Sites and the Services (as each are defined below) provided by Penn Apartment Staffing, Inc. or one of its divisions (collectively, “Penn Apartment Staffing”). If you do not accept these Terms and Conditions or you do not meet or comply with their provisions, you may not use the Penn Apartment Staffing Web Sites or Services. These Terms and Conditions are effective as of January 4, 2017. 2. Binding Agreement. These Terms and Conditions (as they may be amended from time to time by Penn Apartment Staffing), together with your Advertising and Candidate Search Service Agreement (if applicable), form a binding agreement (the “Agreement”) between you and Penn Apartment Staffing. Your access to or use of the Penn Apartment Staffing Web Sites or Services indicates your acceptance of these Terms and Conditions. You are agreeing to use the Sites at your own risk. 3.1 “Penn Apartment Staffing Materials” includes any materials, methodologies, implementation plans or other intellectual property used during the provision of Services. 3.2 “Penn Apartment Staffing Web Site” or the “Site” (collectively, the “Penn Apartment Staffing Websites” or the “Sites”) means any web site under Penn Apartment Staffing’s control, whether partial or otherwise and includes such Site’s Content, Penn Apartment Staffing Materials and Services (as applicable in each context). 3.3 “Content” means Penn Apartment Staffing’s web pages, web forms, programming (including software code used on the Sites and in the Services, including (i) tools, kits, and object libraries, (ii) all third-party or open source code embedded therein, and (iii) any upgrades, updates, releases, fixes, enhancements or modifications to the foregoing), graphics, images, design (color combinations and page layout), text, information, data, resumes stored in various commercial databases operated and licensed by Penn Apartment Staffing, data submitted via the Sites by Users and other content made available through the Sites by Penn Apartment Staffing. 3.10 “Services” means any services provided by Penn Apartment Staffing or its agents described herein and specified more fully in the Service Activation Agreement. 4.1 General Use Rules. The Sites are intended for individuals seeking employment and for employers or recruiters seeking candidates for employment. You may use the Sites only for lawful purposes within the stated context of Penn Apartment Staffing’s intended and acceptable use of the Sites. Penn Apartment Staffing is the sole interpreter of the Sites’ intended and acceptable use. 4.2 Penn Apartment Staffing Intellectual Property Rights. The Sites, the Penn Apartment Staffing Materials and all right, title and interest in and to the Sites and Penn Apartment Staffing Materials are the sole property of Penn Apartment Staffing or its licensors, and are protected by United States and foreign copyright, trademark and other laws. Except for the limited licenses expressly granted to you in these Terms and Conditions, Penn Apartment Staffing reserves for itself and its licensors all other rights, title and interest. Without limitation on the foregoing, you may not reproduce, modify, display, sell, or distribute the Content or Penn Apartment Staffing Materials, or use them in any other way for public or commercial purpose. Notwithstanding anything to the contrary contained herein, this prohibition includes: (a) copying or adapting the HTML code used to generate web pages on the Sites; (b) using or attempting to use engines, manual or automated software, tools, devices, agents, scripts, robots or other means, devices, mechanisms or processes (including, but not limited to, browsers, spiders, robots, avatars or intelligent agents) to navigate, search, access, “scrape,” “crawl,” or “spider” any web pages or any Services provided on the Sites other than the search engine and search agents available from Penn Apartment Staffing on such Penn Apartment Staffing Sites and other than generally available third party web browsers (e.g., Internet Explorer, Firefox, Safari); and (c) aggregating, copying or duplicating in any manner any of the Content or information available from any of the Penn Apartment Staffing Sites, without the express written consent of Penn Apartment Staffing. The use of the Content on any other web site or in a networked computer environment for any purpose is strictly prohibited. The Penn Apartment Staffing Materials are not considered to be works for hire and you may duplicate such Penn Apartment Staffing Materials only for the purposes outlined in the Service Activation Agreement. “Penn Apartment Staffing,” “Personified”, the Penn Apartment Staffing design logo and certain other names or logos are service marks or trademarks of Penn Apartment Staffing, and all related product and service names, design marks and slogans are the service marks or trademarks of Penn Apartment Staffing. In addition, the “look” and “feel” of the Sites (including color combinations, button shapes, layout, design and all other graphical elements) are also protected by Penn Apartment Staffing’s trademarks, service marks and copyrights. Any code that Penn Apartment Staffing creates to generate or display the Content or the pages making up the Sites is also protected by Penn Apartment Staffing’s copyright. You must retain all copyright, trademark, service mark and other proprietary notices contained on the Content or Penn Apartment Staffing Materials on any authorized copy you make of the Content or Penn Apartment Staffing Materials. All other product and service marks contained on the Sites are the trademarks of their respective owners. 4.3 License to Use by Users who are Job Seekers. Penn Apartment Staffing hereby grants you a limited, terminable, non-exclusive right to access and use the Sites only for your personal use seeking employment opportunities for yourself. This authorizes you to view and download a single copy of the material on the Sites solely for your personal, noncommercial use. You agree that you are solely responsible for the content of any Document you post to a Site and any consequences arising from such posting. Your use of the Sites is a privilege. Penn Apartment Staffing reserves the right to suspend or terminate that privilege for any reason at any time, in its sole discretion. 4.4 License to Use by Users who are Employers. Penn Apartment Staffing hereby grants you a limited, terminable, non-exclusive right to access and use the Sites only for your internal business use seeking candidates for employment. This authorizes you to view and download a single copy of the material on the Sites solely for your personal use directly related to searching for and recruiting job prospects. Penn Apartment Staffing also grants you a limited, terminable, non-exclusive license to use the Penn Apartment Staffing Materials and Services for your internal use only. You may not sell, transfer or assign any of the Services or your rights to any of the Services provided by Penn Apartment Staffing to any third party without the express written authorization of Penn Apartment Staffing. You agree that you are solely responsible for the content of any Document you post to a Site and any consequences arising from such posting. Penn Apartment Staffing reserves the right to suspend or terminate your access and use at any time if Penn Apartment Staffing determines that you are in breach of these Terms and Conditions. 4.5 Employer Materials. Employer represents, warrants and covenants that any Employer Materials provided by Employer for use in connection with the Services will not violate any laws or regulations or third-party proprietary rights, including, without limitation, copyright, trademark, obscenity, rights of publicity or privacy, and defamation laws. Employer hereby grants Penn Apartment Staffing a non-exclusive, worldwide, royalty-free license to use the Employer Materials and to hyperlink to Employer’s website in connection with the Services. 4.6 Use of Aggregate Data. You understand and agree that Penn Apartment Staffing owns and has the right to collect, extract, compile, synthesize, and analyze Aggregate Data. Penn Apartment Staffing may use such Aggregate Data for any lawful business purpose without a duty of accounting to you, provided that the data and information is used only in an aggregated and anonymized form so that it cannot be identifiable as relating to you, your Company or to any other Job Seekers. “Aggregate Data” means de-identified aggregated data or information regarding Job Seekers’ educational or career history (including, by way of example and not limitation, aggregate data relating to Job Seekers’ occupation, location, salary, education and experience). 4.8 User Submissions. Penn Apartment Staffing welcomes your comments regarding the Services and the Sites and appreciates hearing from you. Please note, however, that Penn Apartment Staffing does not accept or consider creative ideas, suggestions, inventions or materials other than those which it has specifically requested. If you submit feedback on the Services, please be specific in your comments and do not submit creative ideas, inventions, suggestions, or materials. If, despite this notice, you send Penn Apartment Staffing creative suggestions, ideas, drawings, concepts, inventions, or other information (a “User Submission”), you understand and agree that the User Submission shall become the property of Penn Apartment Staffing. User Submission and any elements contained in User Submissions, shall not be subject to any obligation of confidentiality on Penn Apartment Staffing’s part, and Penn Apartment Staffing will not be liable for any use or disclosure of any User Submission. Penn Apartment Staffing shall exclusively own all now known or later discovered rights to the User Submission and shall be entitled to unrestricted use of the User Submission for any purpose whatsoever, commercial or otherwise, without compensation to you or any other person. 5. Third Party Providers. You acknowledge and agree that Penn Apartment Staffing may provide the Services using third party providers, including subcontractors and consultants (the “Third Party Providers”). You agree that, as between Penn Apartment Staffing and its Third Party Providers, Penn Apartment Staffing will have sole responsibility for handling all billing and contract negotiations. 6. Disclaimers and Limitations on Penn Apartment Staffing’s Liability. 6.1 Allocation of Responsibility Penn Apartment Staffing assumes no responsibility for Documents posted by Users and no responsibility for the activities, omissions or other conduct of Users. Penn Apartment Staffing acts as a portal for the online distribution and publication of User submitted information and has no obligation to screen communications or information in advance and is not responsible for screening or monitoring Documents posted by Users. If notified by a User of a Document which allegedly does not conform to these Terms and Conditions, Penn Apartment Staffing may investigate the allegation and determine in good faith and in its sole discretion whether to remove or request the removal of such Document. Penn Apartment Staffing has no liability or responsibility to Users for performance or nonperformance of such activities. Penn Apartment Staffing may take any action with respect to User submitted information that it deems necessary or appropriate, in its sole discretion. 6.2 No endorsements by Penn Apartment Staffing. Nothing on the Sites shall be considered an endorsement, representation or warranty with respect to any User or third party, whether in regards to its web site, products, services, hiring, experience, employment or recruiting practices, or otherwise. (a) THE SITES ARE PROVIDED ON AN ‘AS IS’ BASIS WITHOUT ANY WARRANTIES OF ANY KIND, EXPRESS OR IMPLIED. Penn Apartment Staffing, TO THE FULLEST EXTENT PERMITTED BY LAW, DISCLAIMS ALL WARRANTIES, INCLUDING, BUT NOT LIMITED TO, THE WARRANTIES OF MERCHANTABILITY, TITLE, NON-INFRINGEMENT OF THIRD PARTIES’ RIGHTS, AND FITNESS FOR A PARTICULAR PURPOSE. Penn Apartment Staffing MAKES NO WARRANTIES ABOUT THE ACCURACY, RELIABILITY, COMPLETENESS, OR TIMELINESS OF THE SITES. (i) Penn Apartment Staffing DOES NOT WARRANT THAT THE SITES WILL OPERATE ERROR-FREE OR THAT THE SITES AND THEIR SERVERS ARE FREE OF COMPUTER VIRUSES OR OTHER HARMFUL MECHANISMS. IF YOUR USE OF THE SITES RESULTS DIRECTLY OR INDIRECTLY IN THE NEED FOR SERVICING OR REPLACING EQUIPMENT OR DATA, Penn Apartment Staffing IS NOT RESPONSIBLE FOR THOSE COSTS. (ii) Penn Apartment Staffing makes no representations or guarantees regarding the truthfulness, accuracy, LEGALITY, completeness, timeliness or reliability of any Documents posted by Users, or of any other form of communication engaged in by Users. Documents may contain inaccuracies or typographical errors. You agree that any reliance on Documents posted by Users, or on any other form of communication with Users, will be at your own risk. (iii) Penn Apartment Staffing makes no representations or guarantees regarding the Content of the SiteS, including, but not limited to, broken links, inaccuracies or typographical errors. (iv) Penn Apartment Staffing MAKES NO REPRESENTATIONS OR GUARANTEES REGARDING THE EFFECTIVENESS OF THE SERVICES OR TIMELINESS OF THE SERVICES IN MEETING YOUR EMPLOYMENT OBJECTIVES. Penn Apartment Staffing DOES NOT GUARANTEE THAT THE SERVICES WILL RESULT IN CANDIDATES BEING HIRED, POSITIONS BEING FILLED OR EMPLOYEES BEING RETAINED, AND IS NOT RESPONSIBLE OR LIABLE FOR ANY BUSINESS, EMPLOYMENT, HIRING AND/OR SALARY DECISIONS, FOR WHATEVER REASON MADE, MADE BY YOU. (b) IN NO EVENT SHALL Penn Apartment Staffing (OR ANY OF ITS OFFICERS, DIRECTORS, SHAREHOLDERS, EMPLOYEES, SUBSIDIARIES, AFFILIATES, AGENTS OR ADVERTISERS), BE LIABLE FOR ANY NON-DIRECT DAMAGES WHATSOEVER (INCLUDING, WITHOUT LIMITATION, INCIDENTAL AND CONSEQUENTIAL DAMAGES, LOST PROFITS, OR DAMAGES RESULTING FROM LOST DATA, LOST EMPLOYMENT OPPORTUNITY, OR BUSINESS INTERRUPTION) RESULTING FROM OR ARISING UNDER OR IN CONNECTION WITH SERVICES OR THE USE OR ACCESS TO, OR THE INABILITY TO USE OR ACCESS, THE SITES AND/OR ANY DOCUMENT, WHETHER BASED ON WARRANTY, CONTRACT, TORT, OR ANY OTHER LEGAL THEORY, AND WHETHER OR NOT Penn Apartment Staffing IS ADVISED OF THE POSSIBILITY OF SUCH DAMAGES. (c) BECAUSE SOME STATES OR JURISDICTIONS DO NOT ALLOW THE EXCLUSION OR LIMITATION OF LIABILITY FOR CONSEQUENTIAL OR INCIDENTAL DAMAGES, THE LIMITATIONS SET FORTH IN THE PRECEDING PARAGRAPH MAY NOT APPLY TO YOU. IF ANY ARE HELD INAPPLICABLE OR UNENFORCEABLE FOR ANY REASON, THEN Penn Apartment Staffing’S MAXIMUM LIABILITY TO YOU FOR ANY NON-DIRECT TYPE OF DAMAGES SHALL BE LIMITED TO U.S. $200.00 IN THE AGGREGATE. (d) IN NO EVENT SHALL Penn Apartment Staffing (OR ANY OF ITS OFFICERS, DIRECTORS, SHAREHOLDERS, EMPLOYEES, SUBSIDIARIES, AFFILIATES, AGENTS OR ADVERTISERS), BE LIABLE FOR ANY DIRECT DAMAGES IN EXCESS IN THE AGGREGATE OF US$200.00 (OR, IF YOU ARE AN EMPLOYER WITH A SERVICES AGREEMENT WITH Penn Apartment Staffing, THE AMOUNTS ACTUALLY PAID BY YOU TO Penn Apartment Staffing UNDER THIS AGREEMENT IF GREATER THAN US$200.00). (e) Due to the nature of this Agreement, in addition to money damages, you agree that Penn Apartment Staffing will be entitled to equitable relief upon a breach of this agreement by you. 6.5 User Authentication. Because User authentication on the Internet is difficult, Penn Apartment Staffing cannot and does not confirm that each User is who they claim to be. Because Penn Apartment Staffing does not and cannot be involved in User-to-User dealings or control the behavior of participants on the Sites, in the event that you have a dispute with one or more Users, you release Penn Apartment Staffing from claims, demands and damages (actual and consequential and direct and indirect) of every kind and nature, known and unknown, suspected and unsuspected, disclosed and undisclosed, arising out of or in any way connected with such disputes. 7. Payment of Services upon Termination of Service Activation Agreement. If at any time during the course of this Agreement you should terminate a Service Activation Agreement or any other services Agreement in which these Terms and Conditions have been incorporated by reference, then Penn Apartment Staffing shall reserve the right to receive all payments from you for the Services used by you up to termination and for fifty percent (50%) of the remaining unused portion of the Service Agreement. 8. Links to Other Sites. Penn Apartment Staffing contains links to third party web sites. These links are provided solely as a convenience to you and not as an endorsement by Penn Apartment Staffing of the contents on such third-party web sites. Penn Apartment Staffing is not responsible for the content of linked third-party sites and does not make any representations regarding the content or accuracy of materials on such third-party web sites. If you decide to access linked third-party web sites, you do so at your own risk. 9. Amendments to this Agreement and Changes to Sites. Penn Apartment Staffing may revise these Terms and Conditions at any time by updating this page. Changes will be binding on you on the date they are posted on the Sites (or as otherwise stated in the any notice of such changes). Any use of a Site will be considered acceptance by you of the then-current Terms and Conditions (including any exhibits thereto) contained on such Site. If at any time you find the Terms and Conditions unacceptable, you may not use the applicable Site any longer. Any new or different terms supplied by you are specifically rejected by Penn Apartment Staffing unless Penn Apartment Staffing agrees to them in a signed writing specifically including those new or different terms. Penn Apartment Staffing may change the Sites at any time. 10. Indemnity. You agree to defend, indemnify, and hold harmless Penn Apartment Staffing (and its subsidiaries, affiliates, officers, directors, employees and agents) from and against any third party claims, actions or demands (including, without limitation, costs, damages and reasonable legal and accounting fees) alleging or resulting from or in connection with your use of the Sites, any Document posted by you, your use of the Services or your breach of this Agreement. Penn Apartment Staffing shall use reasonable efforts to provide you prompt notice of any such claim, suit, or proceeding and may assist you, at your expense, in defending any such claim, suit or proceeding. 11.1 When you register on any of the Penn Apartment Staffing Sites or in connection with the Services, you will be asked to create an account and provide Penn Apartment Staffing with certain information, including but not limited to, a valid email address (“User Information”). You acknowledge and agree that you have no ownership rights in your account. 12. Questions and Notices. Questions concerning the use of the Sites should be directed to Feedback. Notices to Penn Apartment Staffing should be sent to the address listed on the Sites. We will send notice to you at the address submitted by you or to such other address as Penn Apartment Staffing reasonably determines is an appropriate address for you. 13. General. Penn Apartment Staffing contact information is listed on the Sites. Penn Apartment Staffing makes no claims that the Content is appropriate or may be downloaded outside of the United States. Access to the Content may not be legal by certain persons or in certain countries, and such persons have no right to access or use the Sites. If you access Penn Apartment Staffing from outside of the United States, you do so at your own risk and are responsible for compliance with the laws of your jurisdiction. This Agreement and your Service Activation Agreement, if you have one, are governed by the internal substantive laws of the State of Illinois, without respect to its conflict of laws principles. Jurisdiction for any claims arising under this Agreement or your Service Activation Agreement shall lie exclusively with the state or federal courts in the State of Illinois. The sole relationship between you and Penn Apartment Staffing is that of independent contractors. If any provision of this Agreement is found to be invalid by any court having competent jurisdiction, the invalidity of all or part of a provision shall not affect the validity of the remaining parts and provisions of this Agreement, which shall remain in full force and effect. All provisions of this Agreement shall survive termination except those granting access or use to the Sites, and you shall cease all your use and access thereof immediately. You may not assign or transfer your obligations under this Agreement. No waiver of any term of this Agreement shall be deemed a further or continuing waiver of such term or any other term. Except as expressly provided by Penn Apartment Staffing in a particular “Legal Notice,” or material on particular web pages of the Sites, this Agreement and your Service Activation Agreement where applicable, constitute the entire agreement between you and Penn Apartment Staffing. (b) You may not use a Document(s) to: (i) impersonate another person, living or dead; (ii) post false, inaccurate or misleading information, opinions or notices (commercial or otherwise) or chain letters; (iii) post advertisements, or solicitations of business (including, but not limited to, email processors, any pyramid scheme or “club membership”); provided, however that Penn Apartment Staffing may allow posting of certain training and business opportunities (see 14.1(e) below). (e) In limited circumstances, at Penn Apartment Staffing’s sole discretion, Penn Apartment Staffing allows non-traditional job postings such as education/training, business opportunities, franchise, and multi-level marketing opportunities to be posted on the Sites. These non-traditional job postings may require an investment of time and/or money by the User seeking the position. Penn Apartment Staffing reserves the right, in its sole discretion, to move, modify, or remove entirely a non-traditional job posting if Penn Apartment Staffing deems such job posting to conflict with the best interests of its Users or detract from the User experience. (g) Penn Apartment Staffing is under no obligation to monitor the Documents posted on the Sites, but it may monitor Documents at random. Documents found to violate the above Posting Rules may be removed at Penn Apartment Staffing’s sole discretion. (c) Protect your password. Your Penn Apartment Staffing account and any related Services accessed through such account are to be accessed and used solely by you. Upon your successful registration for a Penn Apartment Staffing account, you will be provided with a unique password that will permit you to access the account. You may not provide your password or otherwise permit access to your Penn Apartment Staffing account to any third party. You are responsible for maintaining the confidentiality of your information and password. You agree to protect and keep your password confidential, to change your password on a regular basis, and to maintain appropriate and regularly updated malware scanning and cleaning tools on your network and individual computer(s).You are responsible for all uses of your account, whether or not authorized by you. If others use your password to post inappropriate material on the Sites, you risk losing your access to the Sites. You agree to notify Penn Apartment Staffing immediately of any unauthorized use of your account or password. (f) If at any time Penn Apartment Staffing comes to the understanding that you: (i) misled Penn Apartment Staffing regarding your business practices and/or services, or (ii) purchased services that do not represent your precise business, Penn Apartment Staffing reserves the right to terminate your Agreement. (b) Violation of these Security Rules may result in civil or criminal liability. Penn Apartment Staffing will investigate occurrences which may involve such violations and may involve, and cooperate with, law enforcement authorities in prosecuting Users who are involved in such violations. 15.1 Penn Apartment Staffing respects the intellectual property of others. It is Penn Apartment Staffing’s policy to respond to claims of copyright and other intellectual property infringement. Penn Apartment Staffing will promptly process and investigate notices of alleged infringement and will take appropriate actions under the Digital Millennium Copyright Act (“DMCA”) and other applicable intellectual property laws. Upon receipt of notices complying with the DMCA, Penn Apartment Staffing may act expeditiously to remove or disable access to any material claimed to be infringing or claimed to be the subject of infringing activity and may act expeditiously to remove or disable access to any reference or link to material or activity that is claimed to be infringing. 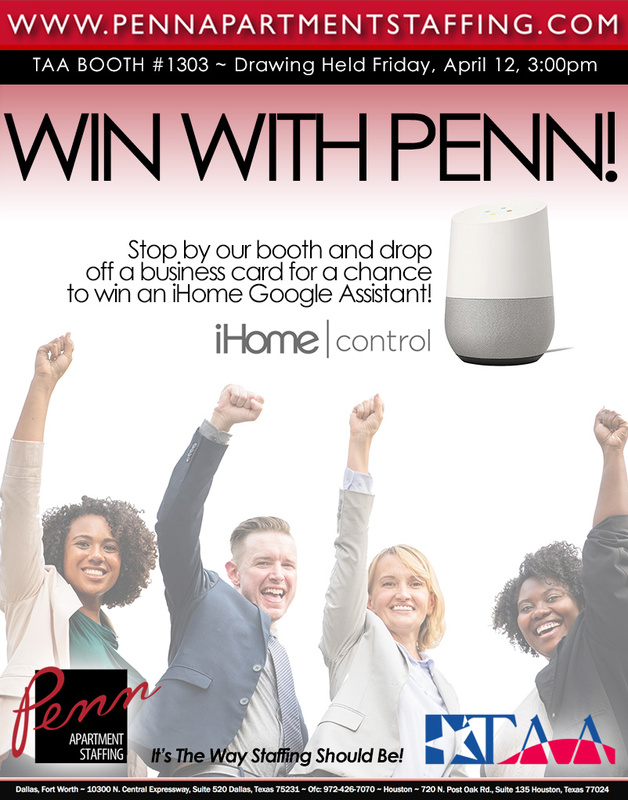 Penn Apartment Staffing will terminate access for Users who are repeat infringers. 15.2 Notifying Penn Apartment Staffing of Copyright Infringement: To provide Penn Apartment Staffing notice of an infringement, you must provide a written communication to the attention of “Trust and Site Security” care of TSST@Penn Apartment Staffing.com that sets forth the information specified by the DMCA (http://www.copyright.gov/title17/92chap5.html#512). Please also note that you may be liable for damages (including costs and attorneys’ fees) if you materially misrepresent that an activity is infringing your copyright. 15.3 Providing Penn Apartment Staffing with Counter-Notification: If we remove or disable access to content in response to an infringement notice, we will make reasonable attempts to contact the owner or administrator of the affected site or content. If you feel that your material does not constitute infringement, you may provide Penn Apartment Staffing with a counter notification by written communication to the attention of “Trust and Site Security” at TSST@Penn Apartment Staffing.com that sets forth all of the necessary information required by the DMCA (http://www.copyright.gov/title17/92chap5.html#512). Please note that you may be liable for damages (including costs and attorneys’ fees) if you materially misrepresent that an activity is not infringing the copyrights of others. If you are uncertain whether an activity constitutes infringement, we recommended seeking advice of an attorney. 16.1 Penn Apartment Staffing grants you a limited, personal, terminable, non-transferable, non-exclusive right to access the Penn Apartment Staffing Resume Database via the Sites for the purpose of viewing and/or downloading a single copy of available paper and/or video resumes (collectively “Resumes”) solely for your use. 16.4 Neither you nor your Authorized RDB Users may use the Resume Database in any way which, in Penn Apartment Staffing’s sole judgment, adversely affects Penn Apartment Staffing’s business, business prospects, the performance or function of any Site or the Resume Database, or interferes with the ability of other subscribers to access the Resume Database. Further, use of the Resume Database by you or by your Authorized RDB Users may not interfere with or violate, in any manner, the privacy election of Penn Apartment Staffing Job Seekers. You understand and agree that any violation of section 16 will give Penn Apartment Staffing the right to immediately terminate any and all access to the RDB and to terminate any corresponding Agreements. 16.5 You and your Authorized RDB Users may use your subscription to the Resume Database only for seeking candidates for employment and are specifically prohibited from using information contained in the Resume Database to (i) sell or promote any products or services, (ii) send emails that, in Penn Apartment Staffing’s sole judgment, are excessive in frequency or contain job postings that are irrelevant to the work history of particular classes of Job Seekers or (iii) take any other action that is, in Penn Apartment Staffing’s sole judgment, inconsistent with these Terms and Conditions, misleading or incomplete, or in violation of any Federal, State, Local law, statute, code, rule, or regulation. Company understands and agrees that if Company uses the Resume Database in violation of the preceding restrictions, then Penn Apartment Staffing may, at its sole discretion, either terminate Company’s Agreement or transfer Company’s Seats from the Resume Database to the Targeted Resume Database (a database that only contains individuals whom Penn Apartment Staffing has identified as appropriate candidates for sales positions where the majority of the compensation is to be derived from commissions). 16.6 Penn Apartment Staffing may terminate, suspend, update, alter or supplement, at its sole discretion, all or any part of the Resume Database at any time. By permitting access to the Penn Apartment Staffing Resume Database, Penn Apartment Staffing does not convey any interest in or to the Resume Database or any other Penn Apartment Staffing property or Services. All right, title and interest in and to the Resume Database is and shall remain in Penn Apartment Staffing. 17.2 Penn Apartment Staffing grants Company a limited, personal, terminable, non-transferable, non-exclusive right to access Recruitment Edge via the Sites for the purpose of viewing and/or downloading a single copy of available profiles (collectively, “Profiles”) solely for Company’s internal use. Recruitment Edge is to be accessed and used solely by Company through its authorized Users. Company may download, one at a time, up to either 150 Profiles per day (per Recruitment Edge user license). Please note that the term “download” shall include: (i) viewing or clicking on a Profile page; (ii) saving a Profile to a folder; (iii) printing a Profile; (iv) copying a Profile; (v) emailing or forwarding a Profile; and/or (vi) any other action that results or could result in Company’s use of a Profile or any of the information contained therein. In addition, if a search in Recruitment Edge yields a Profile for a potential candidate who is part of the Penn Apartment Staffing Search Database, then the search will count against that Search Database Seat’s monthly download limit rather than the Recruitment Edge Seat’s daily download limit. 18.1 Use of Reports. Penn Apartment Staffing hereby grants you a limited, non-exclusive, non-assignable (except as otherwise provided in this Agreement), worldwide right and license to: (a) store and use any Recruitment Analytics Services for your internal management, reference or informational purposes, and (b) distribute copies of any reports generated by the Recruitment Analytics Services (each a “Report”), subject to the conditions that (i) such copies may be distributed only in printed or static electronic PDF format, (ii) in providing a copy of any Report to a recipient, you may not charge the recipient any kind of fee or other consideration, and (iii) you shall not remove or modify any branding, marks, copyright or trademark notices, or any other notices or disclaimers set forth in any Report without Penn Apartment Staffing’s prior written consent, or otherwise modify the Report in any way so as to falsely or otherwise misrepresent its content. Further, you may not issue press releases or make other public statements regarding any Report, or the contents or conclusions in same, without the express written consent of Penn Apartment Staffing. 18.2 Use of Your Data. If you have purchased Recruitment Analytics Services, then you may provide Penn Apartment Staffing with the names, addresses, telephone numbers, e-mail addresses, resumes and other personally identifiable information of Job Seekers sourced from your own files (“Job Seeker Data”). You hereby grant Penn Apartment Staffing a non-exclusive license to use, copy, modify, store, transmit and display Job Seeker Data solely to the extent reasonably required to provide and maintain the Services for Company’s use. Notwithstanding the foregoing, you understand and agree that Penn Apartment Staffing may derive Aggregate Data from the Job Seeker Data and may use such Aggregate Data in accordance with section 4.6.